This traditional high back upholstered chair will make a sophisticated addition to your living room or family room. Its elegant wing back, rolled arms, plump seat cushion and exposed wood oak chippendale legs create a classic design. Choose from a variety of fabrics to match your style and decor, and pair with the matching ottoman for a coordinated look. The 1414 Traditional High Back Chair with Oak Chippendale Base by Lancer at Town and Country Furniture in the Hamburg, Buffalo, Lackawanna, Eden, NY area. Product availability may vary. Contact us for the most current availability on this product. Enhance your living room or family room with the traditional style of the 1414 group. This upholstery collection features a high back chair and ottoman with oak chippendale bases. Smooth, rolled arms and a curvy wing back create a classic shape with elegant flair. With many options of fabrics to choose from, you can create a comfortable design that will match your style and decor. 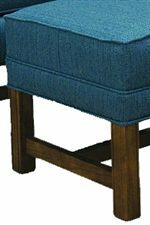 The 1414 collection is a great option if you are looking for Traditional furniture in the Hamburg, Buffalo, Lackawanna, Eden, NY area. 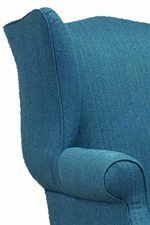 Browse other items in the 1414 collection from Town and Country Furniture in the Hamburg, Buffalo, Lackawanna, Eden, NY area.